In case your missed Don Barrett’s Word of the Month poem yesterday, here it is again, with his permission. It seems a fitting poem for today, the times, and the great sadness we’re feeling. Thanks, Don. HAVE WE BEEN BAD ? NO MORE SOUND IT’S VERY CLEAR. WHAT HAS HAPPENED YOU ARE SO SAD. NOW WE SEE A LIGHT SO BRIGHT. GOD HAS TAKEN US FROM DARK TO LIGHT. WE ARE OKAY WE HOPE YOU ARE TOO. WE LOVE YOU SO MUCH DON’T BE SO BLUE. WE JUST DO NOT KNOW WHEN. I’m grateful to Joy Acey for providing us not one but three poems today. Joy, thank you for pitching in. I enjoyed reading your work and am happy to share it with others! And as for you — others — please don’t forget that I always hope to receive some poems to share on Sunday Poets. Now, here’s Joy. stands a couple in desert camo. His arms wrap across her back. pulling his head forward in an embrace. strokes it like a puppy. sniffles and wipes her nose. He whispers in her ear. He helps put on her backpack. for one last deep kiss. would rush to welcome you home. between blue bath towels in the linen closet. on chairs with frayed plastic cushions. climb rocks in my yard. jumps from rock to rock. his throat pumps like a bellows. as if scenting the air. His jaws move up and down. and then out of sight. Jeanne Poland is back with a new poem that reflects on suffering, devastion, and faith in the aftermath of Sandy. Grasping through our private space. Can’t sew it up quickly. Not the stink of it. 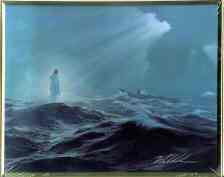 The grace to walk on water! Lifts me up, makes all things NEW! TO EVERYONE IN THE PATH OF SANDY, OUR THOUGHTS AND HOPES ARE WITH YOU. BULLETIN: Considering the challenge before us — writing poems about children who are not exactly sweet and nice — I think I’ll leave this one up for another day or so. Jump in and share your own poem about the less than perfect child of your feverish imagination. ANNOUNCEMENT: Sorry to tell you but no one shared a poem with us for today. The good news is that this gives you time to write something for next Sunday. So what’s a post papa to do? Maybe all you poets out there are simply tired of telling children how good they are when you’ve personally met a few who are not. I say let’s take a holiday and tell it like it is! Stand up for our rights. There are some real stinkers out there and it’s time we poets let our true feelings out! I’ll go first and you, if you aren’t a fraidy cat, can follow with revelations of your own. I suspect that some of our student writers can probably tell us a few terrible tales of their own. Who drives his family wild! If you see Ollie coming, pray! Child who’ll drive you wild! I didn’t hear from another poet for this past week so I’ll pop in one of my own poems. I hope to hear from more of you this coming week. Like some pimple on your face. who was writing this brochure, and for whom? a limited vocabulary of words they recognize in print. thing – and had actually published a brochure. to become a better butterfly!